We get asked all the time to do exact color matching with our seat covers, but this can often be darn near impossible. While there are infinite varieties and nuances of paint finishes, there are not infinite colors of vinyl available, so we have to do the best that we can. 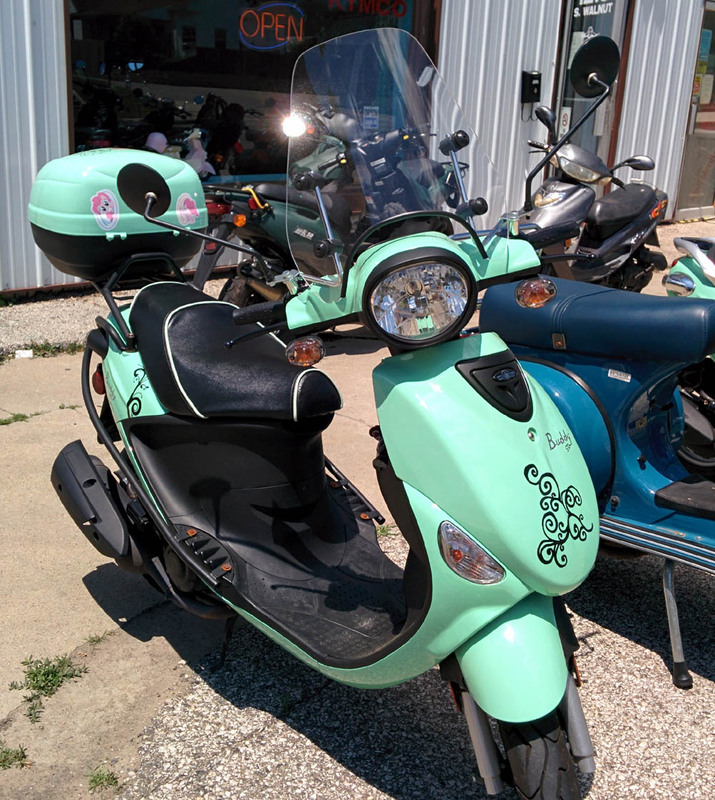 We love Genuine Scooters, but some of their colors can be very difficult to match, as in the case of this Sea Foam Buddy scooter. It is actually on my bucket list to have lunch with the person/people who decide the color palette for the Genuine scooters, I am honestly interested to learn what goes into that decision making process, and how they arrive at those colors. The Buddy Sea Foam is more blue than a standard Sea Foam, which is a bit more on the grey side. However, in the use of piping, the eye will work to match the color, it’s the coolest effect and as you see, this looks like a pretty good color match, and our customer was happy. Had we flanked the seat cover with our Sea Foam vinyl, so that it was touching the panels of the Buddy, the effect would not have been nearly so pleasant, because the eye would immediately pick up on the difference between the two colors. In general, we recommend that if someone is doing a custom paint job, they consider their seating colors at the same time, because it’s much easier to add just a touch more yellow to paint than it is to find vinyl that has that exact twinge of color. If you love this seat cover, we have this in our store HERE, as well as many other Genuine Buddy seat covers!